You can probably chart your kids’ growth by their expanding DVD collection, starting with Baby Einstein and Elmo and climbing to The Pirates of the Caribbean. But what do you do with all those dust-gathering Sesame Street videos now that your baby is grown up and practicing swashbuckling? Swaptree has the perfect solution: Trade them in and get new-to-you DVDs in return. 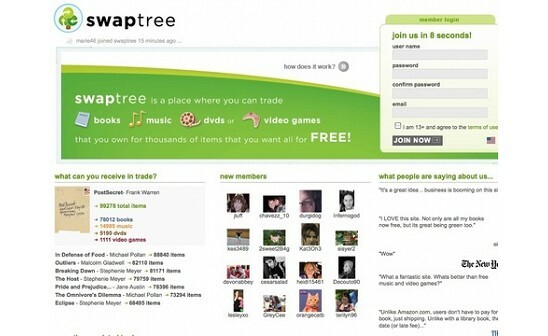 Swaptree is an online trading service for books, movies, CDs, and video games. The website’s search algorithms do the work of suggesting trades, so you don’t have to worry about finding sellers or negotiating prices. Just list the stuff you want to trade, and Swaptree shows you thousands of items you can receive in return. You’ll find lots of interested traders if you’ve had your fill of Wii Fit, for instance, or you’re done reading “The Time Traveler’s Wife” (a hot title these days). The service is free, but you have to pay for shipping. With the site’s automatic shipping label feature, you can print an address label and postage then just drop your package in the mail. Greg Boesel and Mark Hexamer founded the company after years of trading books in the real world and watching their nephews obsess about — and then forget about — a different video game every week. It’s a great time to get in on the bartering. Sharing and reusing your old music, books, and videos is easy on your wallet and the environment. Hi everyone! Swaptree is a site where you can trade books, music, movies, and video games that you don't want, for the books, CDs, DVDs, video games that you do want, for free. Unlike auction sites or other used item sites where you can sell or purchase items, on Swaptree your items will only cost you the price of shipping which is around $2.50. The site is easy to use, you just list the items that you have to trade and the items that you want to receive and Swaptree sets up the trades for you. The best part is that once you get an item from someone and you finish reading, listening, or viewing it, you can just list it on Swaptree and get something else for it! And besides saving a bunch of money for your family, you are also being green by recycling old media instead of buying new items (which means consuming less additional resources and less waste in our landfills!). We're really excited about being here on Daily Grommet today. I look forward to reading your comments and am happy to answer questions. I can not begin to tell you how much I appreciate Swaptree!! I have Saved SO Much money just in the few months that I have been a member. We are in the process of switching all our "non" christian items over to Christian or at least "not bad" items! Our biggest issue was loosing a 20.00 movie for 3.00 and then not being able to replace it!! Well Not any more! Now I lose a 20.00 movie but gain a 20.00 movie!! We only pay for our shipping to ship out the item (the other person pays to ship their item to you) So for what 1.90 (give or take) I get a New to us movie / book / cd or game?? Awesome!! I am wittymomma on there so look me up & Lets Swap!! Okay well I have to add my details... Sorry to gab but.. I'm not only Swaptree's Cheerleader, but I am also a swapper! lol. 76 trades in 65 days lol. that is AWESOME!! I have saved $452 bucks by paying apx $144 in shipping... thats IT!! ok I will get off my soapbox now... just SIGN UP!! It is FUN & FREE & you meet great people on the forum!! Oh & I won a Book from one of their Give aways! Signed Copy!! Awesome!! Glad to hear you've been finding Swaptree helpful Misty! Pretty impressive that you've been averaging a trade a day, I'm sure your media shelves have turned over a new leaf. Keep on swapping, saving, and having fun. This sounds so great; my kids are teens now but we have mountains of DVDs and video games that are still in perfect condition. Can't wait to put them to work on emptying out our shelves! How long do you usually have to wait for a trade and do you find you get lots of options for what your trade can be swapped for? Would love it if I could search by zip/area code too so I can make trades more locally. Is that a possibility? JK - Thanks for your interest in Swaptree. Unfortunately, Swaptree is currently available to US residents only. However, we hope to be expanding to support residents of Canada in the coming months. So stay tuned. Another Swaptree addict here. I'm love this site! I'm a big reader so instead of buying books I trade old ones for new ones I want to read. So much fun (and good for my wallet and the plant too). Thomas - The answer to your question, as you can imagine, is really dependent on what your trading and what you want. If what you have and want are obscure items, it may take a little bit longer to get a trade than if you are trading a NYT Bestseller for another NYT Bestseller. Many many items will currently give you over 100k items in trade to choose from. One of the more popular items on the site right now is the Twilight Series. In fact the Twilight books are the most wanted AND listed for trade. We do literally several thousand trades a day, so good trades are very easy to come by. While you can't sort or search by zip code, when you choose the item you are to receive, we show you the distance your potential trade partners are from you. This allows you to choose your partner based on shipping time, if that's an important factor to you. We hope to have a more advanced location search in the coming months. Bethany glad you love it, and Laura get those kids to work and welcome aboard! In the video you mention that the community "self-polices" by giving out ratings. But what can I do if I make a trade and the item never shows up ... or if it's in worse condition than it was supposed to be? Do you ever get involved to resolve a dispute, or is there a way to get my item back? How does Swaptree make money by doing this? Are there registration fees, transaction fees, etc.? Melissa - There's certainly a trust element involved in any user-user online transaction, and Swaptree is no exception. Fortunately, we've implemented many safeguards to reduce the risk of a negative experience in the first place. 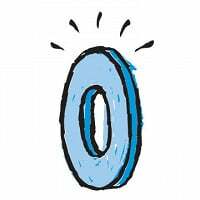 On rare occasion (less than one-half of one percent), the item may not be received in the specified condition, or a user may not receive the item they traded for. Should the need arise, a component of our Customer Support team dedicated to trade resolution, will help you work through the conflict, ensuring open lines of communication with your trade partner. In short, we have a step-by-step process that effectively handles any non-receipt situation. If an item (CD, DVD, or game) is received in non-working condition, we take similar steps to work directly with you and your trade partner. In many cases, users are willing to furnish a replacement copy, or if the item was damaged in transit, we provide the necessary resources to follow up with the package carrier. Although Swaptree does not make guarantees as to item condition, our formal procedures for handling these situations have proved extremely effective. In addition, we continue to take steps towards keeping the Swaptree community free of problem users, which helps in reducing the likelihood of a negative experience. As with all user-user transaction sites such as eBay, Craigslist, etc, there will always be the possibility of an unsatisfactory experience. We'd like you to rest assured that our calculated and timely actions have kept our site's user experience a notch above the rest. Great review and description - I really like this concept. Every year our town has a giant swap like this that we participate in, but I like how this is organized and think it's a great way to get kids involved too. You're so right about the "green" benefits. I'd prefer to just get books from the library, but the fact is, you can't always find what you need. Very smart. Do you have plans to roll this out to other kinds of swaps? I'd love to see something for sports equipment ... camping gear. In fact, if anyone out there knows where to go for this kind of swapping online let me know about it. Where else can I swap a Texas cookbook for a book about building a toy robot? Using Swaptree postage labels makes the whole process so simple and gratifying, and I love getting packages in the mail. It's also great to see what other people are reading. It's a browser's delight! One suggestion...I'd love to be able to input search parameters by data field. For example, dime store novels vary widely in terms of quality, so I often choose titles based on the publishing house. I can narrow book lists by category of fiction, for example, but then I have to click on each one to see the publisher. Swaptree is my new favorite site. Keep up the great work. Something that did not make it into our review is the sophisticated database technology behind Swaptree. Greg (in the video) and I talked about it at length, over a beer, and I came away very impressed. (And it was only one beer so my faculties were perfectly intact! :) ) And....he is a really nice guy to boot. He bought the beer, in fact. I stumbled upon Swap tree by chance one day, and ever since been hooked. I have traded CDs and books that I really couldn't care less about and received excellent things in return! I got two Doors Double albums in MINT conditiion, I got CDs that I couldn't even find in regular places, I even got books for my kids at school. I am very happy with Swaptree and the members are trustworthy, fair and friendly. I deal with ebay, but it's a bit more hostile. Swaptreeis a good family type community. @PN, thank you for sharing that amazing testimonial! I especially love your comment about trust -- we human beings aren't all bad, are we? 245 trades is impressive, and inspiring. I agree that the Swaptree team has created an amazing service here. Paul - We are focusing on these 4 media types for now. However we very much are planning on expanding into other categories like clothes, collectibles....yes camping gear etc. So stay tuned.....for now check out Craigslist or Freecycle, im sure they will have some camping equipment listed there. Greg -- Thank you so much for making this swap process so simple and user-friendly. I can't wait to try this out. Fantastic idea and site! My whole family has gotten into trading on Swaptree. My kids love it because they can try out a new game for less than it would cost to rent one. They can also keep it for as long as they want (instead of just a week) and then put it up for trade again when they are ready to try something else. We've done this several times and it is such a fun and economical way to keep our game library fresh. I use it to trade books and CD's mostly and have received some great new things in the process. We have also traded some of our old Disney DVD's that the kids don't watch anymore for games and action movies. I have only been trading for a couple of months but have already had 31 trades. I can wholeheartedly recommend it to anyone like me who loves books, games, movies and music but doesn't have the unlimited resources to go out and buy new things on a weekly basis. Thanks Greg for coming up with such a great site! Wendy & Angela - thank you, and I am glad you like what we have been working so hard on. We are exicted about what we have built but are even more excited about all the new features and ideas we have that you will soon see on the site. this looks really interesting. i hope you guys leave craigslist in the dust! i'd like to see sports gear swaps too. are you going to start selling advertising? OBone - we'd love to leave Craigslist (among many others) in the dust! We plan on expanding across sporting goods and outdoor gear in the near future. Additionally, we currently run paid advertising on the site, and will be rolling out some laser-targeting features for our advertisers in the coming months. As the site continues to grow in both breadth of audience and depth in items, Swaptree demands serious consideration from both brands and agencies alike. We're really looking forward to building up the advertising site to help keep the site free for our members new and experienced. Keep your eyes pealed for some exciting new developments! I was so glad to see Daily Grommet share this discovery. I learned of SwapTree two years ago and have come to know the team and have become an active swapper. Barter is an age old activity...but SwapTree has found a way to really make it simple for books, cds, dvds and video games via the Internet. Very cool service. It's amazing to watch businesses bring age old practices efficiently into the digital age. Jeff, thanks for stopping by to share your experiences. You can probably chart your kids’ growth by their expanding DVD collection, starting with Baby Einstein and Elmo and climbing to The Pirates of the Caribbean. But what do you do with all those dust-gathering Sesame Street videos now that your baby is grown up and practicing swashbuckling? Swaptree has the perfect solution: Trade them in and get new-to-you DVDs in return. Swaptree is an online trading service for books, movies, CDs, and video games. The website’s search algorithms do the work of suggesting trades, so you don’t have to worry about finding sellers or negotiating prices. Just list the stuff you want to trade, and Swaptree shows you thousands of items you can receive in return. You’ll find lots of interested traders if you’ve had your fill of Wii Fit, for instance, or you’re done reading “The Time Traveler’s Wife” (a hot title these days). The service is free, but you have to pay for shipping. With the site’s automatic shipping label feature, you can print an address label and postage then just drop your package in the mail.